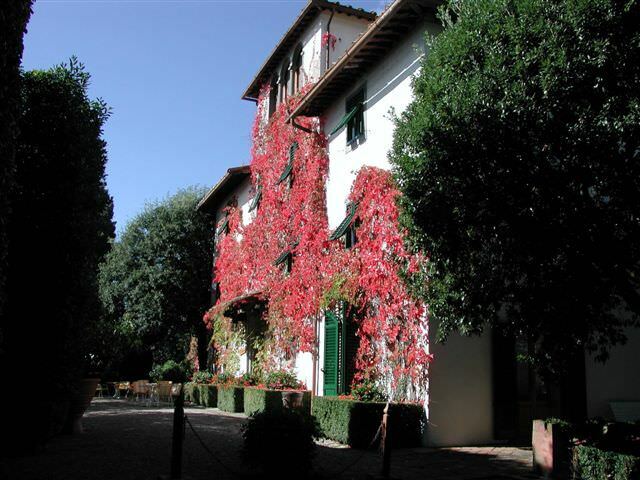 Want to see more of Tuscany than what regular paved roads will show you? 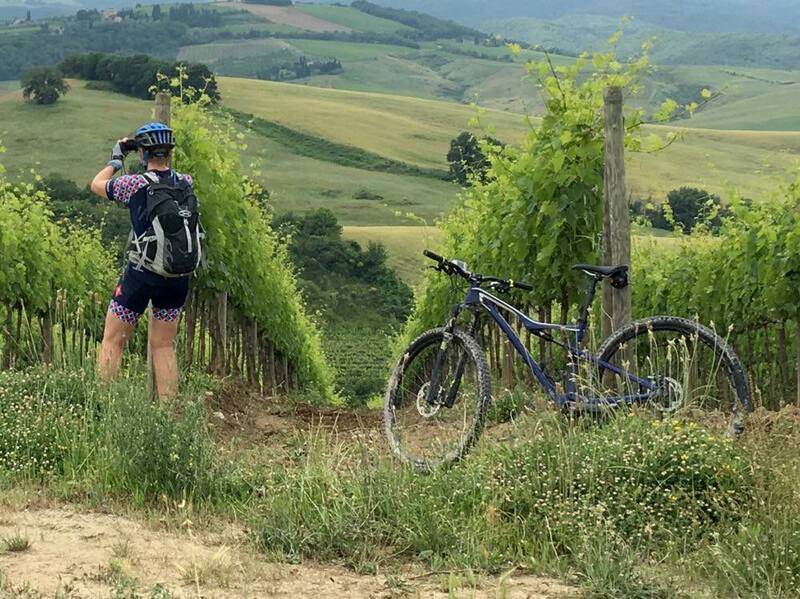 We are now offering a guided Tuscany mountain bike tours in a fashion very similar to our self guided tours – YOU name the dates of the tour. 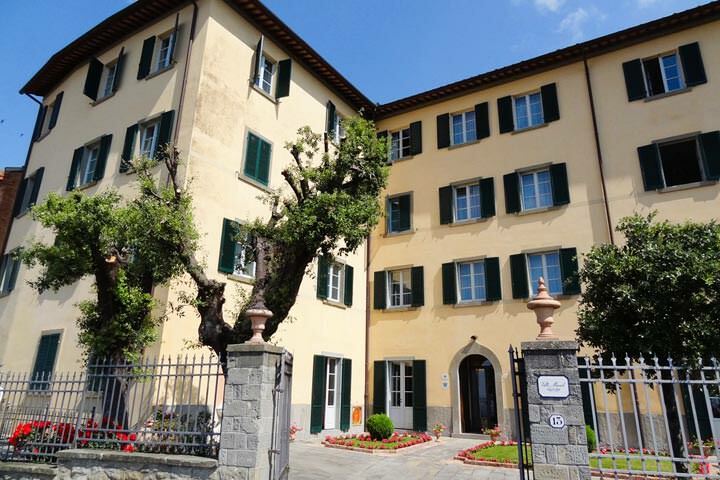 The below itinerary follows the recently restored original route of the ancient Via Francigena, a major Medieval pilgrimage way that connected Northern Europe to Rome. Mentioned for the first time in 909 AD by the Archibishop of Canterbury Sigerico (who described his journey back home from Rome to Canterbury), the Tuscan stretch of the Via Francigena passes through Val d’Elsa and Val d’Orcia. You’ll be riding the most scenic part of this route from Castelfiorentino to Ponte a Rigo passing San Gimignano, Monteriggioni, Siena, Buonconvento and Montalcino. 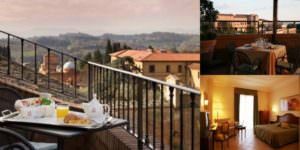 Rich in history and natural beauty, It follows a breathtaking circuit through the Tuscan hills, woods, and fields. You will encounter monasteries, castles, hospices that welcome pilgrims, ancient walled communities, and riding sections of paved roads that go back to Roman and Medieval times. A stunning way to combine a beautiful vacation with the passion of cycling. This tour is being led by our long-time Tuscany guide, Bruno Baldini. He is a native of Florence with a passion for the mountain bike. He knows every trail in the region like the back of his riding glove, and loves sharing his favorites. This is a guided tour, so Bruno will be with you the entire way. In true OBT style we have put together a tour that is not overly intimidating. The rides will be challenging, but don’t worry about hour after hour of technical single track. These trails and roads have been selected to challenge, but not break you. Rental bikes are available. All breakfasts and dinners are provided. Lunches are on your own, which you can enjoy finding in the small villages and cafes along the way. See full itinerary below. We can customize as you wish. 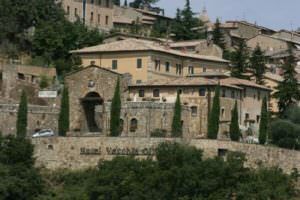 Or click here to learn more about all of our Tuscany bike tours. Dates: Your pick! We offer tours in Tuscany as early as March and as late as October and into November. Service: Fully Guided and Supported. Type of riding: Hilly with off and on-road sections. Suggested transport: Fly or train to Florence from anywhere. We generally target 3 and 4-star hotels, which we hand select to maximize comfort while minimizing cost. The star rating is using a French rating system, which has proven to be the standard around the world. Therefore we use the same standards in France and beyond. Over the years we have developed relationships with many amazing 3 and 4-star properties that distinguish themselves as providing much more than their rating suggests. We have loved getting to know these hotels and sharing them with our guests. For tour groups wishing to upgrade their accommodations, we can provide custom pricing for four and five-star hotels, pending availability. Below are an example of some of our favorite hotels in the region that we target using on our tours, pending availability. All bikes come with helmet, repair kit, pump (or CO2 cartridges), lock, and water bottles. During the registration process, you will be asked for sizing specifics to ensure we have the correct sized bike waiting for you. We can supply a number of styles of pedals – please ask if you don’t see the pedal type you’re looking for on the registration form. Mountain Bikes: Our rental mountain bikes are hardtail with a front suspension. Perfect for the local trails! Reach out to us if you’re interested in a full suspension bike. Components – Mixture of Shimano SLX with either triple or compact double cranksets. All hotel accommodations – mostly 3 and 4 star but ask for custom accommodation requests. Meals as explained in the tour itinerary pages. Usually this means all breakfasts, no lunches, and some dinners. Outstanding routing instructions for all rides! This includes GPS course downloads for your GPS unit, traditional cue sheet, and written prose describing each turn and the surrounding area. These methods are then supported by a road map. Your personal guides, helping you with support vehicles. On road support will always be near. From greeting guests when they arrive, to handling luggage transfers, mechanical issues, etc – our guides assist guests in every way. They also set you up on your rental bikes, and can help with routing, and any other questions. Transportation to start location and from finish location. Bikes, but we have rental bikes available. Admission to sightseeing venues, unless explicitly mentioned as included. Day 1: Transfer from Florence to Chiesanuova then ride to San Donato in Poggio – 37 km (18 on unpaved roads) – total vertical: 750 m.
Ride across the scenic hills of Chianti to the hilltop medieval village of San Donato in Poggio passing the ancient and picturesque abbey of Badia a Passignano. First stage of this bike tour begins with a scenic 6 km. downhill on tarmac to the village of Cerbaia, where we’ll start the ride to the ancient fortified abbey of Badia a Passignano, which stands in a picturesque position on top of a scenic hill covered with vineyards and olive groves. From the abbey a quick but short downhill section to the Pesa river before the last climb of the day to the hilltop medieval village of San Donato in Poggio (Poggio is the Tuscan word for hill). 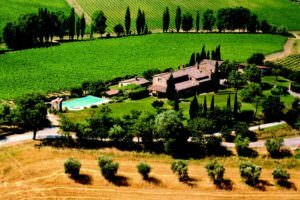 Day 2 : Ride to San Gimignano – 34 km (15 on unpaved roads) – total vertical: 750 m.
Ride across the vineyards and olive groves of Chianti to the famous medieval fortified town of San Gimignano, (the city of the beautiful towers), passing the ancient romanesque church of Sant’Appiano. 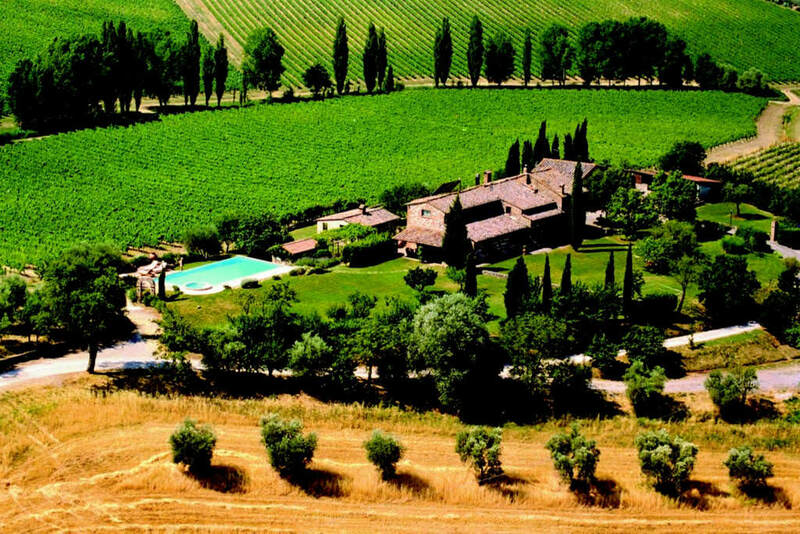 After a short downhill on unpaved roads across woodland we’ll be climbing the scenic ridge of the hills of Val di Pesa, riding across picturesque vineyards and country stone houses. 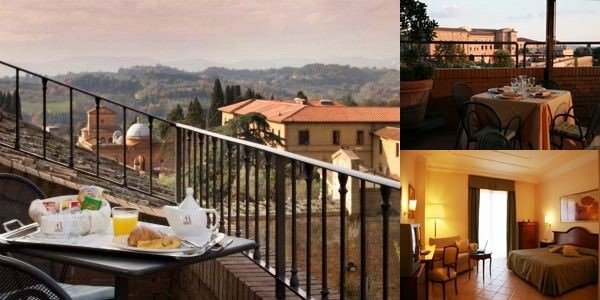 A quick and fast downhill half on dirt roads and half on tarmac will lead us into the Elsa Valley, where we’ll be riding to San Gimignano, passing the ancient romanesque church of Sant’Appiano and following a scenic section of the Vernaccia Wine Road. Day 3: San Gimignano to Strove – 31 km (12 on unpaved roads) – total vertical: 500 m.
Ride along the scenic Val d’Elsa following part of the Vernaccia Wine Road and the ancient Via Francigena to the village of Strove, passing the evocative medieval fortified town of Colle Val d’Elsa. Another downhill start for this fourth stage following a scenic section of the Vernaccia Wine Road that runs the ridge of the hills around San Gimignano. After a short climb on tarmac will be riding a few kilometers on flat road to the picturesque medieval village of Colle Val d’Elsa. A quick loop inside its walls following evocative narrow passages before riding a short and steep downhill to the bottom of the valley, where after a few kilometers flat across the lower part of town we’ll meet and follow the original course of the Via Francigena that will lead us to the cosy village of Strove. Day 4: Strove to Siena – 31 km. (18 on unpaved roads) – total vertical: 550 m.
Ride along the Via Francigena to Siena, passing the ancient romanesque abbey of Abbadia Isola and the picturesque castle of Monteriggioni. Riding shady tracks across woods we’ll reach the scenic castle of Monteriggioni, one of the best preserved medieval fortified villages of Tuscany, passing the evocative Xth century abbey of Abbadia Isola, built on what was a sort of little island in the recently (XVIIIth century) reclaimed marshland. From Monteriggioni to Siena we’ll be riding some scenic rolling hills across woodland and vineyards, enjoying some great views over the approaching medieval city skyline. Day 5: Siena to Buonconvento – 35 km. (25 on unpaved roads) – total vertical: 400 m.
Ride along the Via Francigena following the rolling ridge of the hills south of Siena with stunning openings over the Val d’Orcia Riding out of Siena the Via Francigena will soon follow the ridge of scenic hills covered with green meadows with spectacular views over scenic Val d’Orcia, recently declared World Heritage Site by U.N.E.S.C.O. During the second part of the ride terrain is mostly flat and compact until we reach the medieval fortified village of Buonconvento. Day 6: Buonconvento to Bagno Vignoni – 29 km. (17 on unpaved roads) – total vertical: 700 m.
Ride along Via Francigena to the medieval village of Bagno Vignoni, passing the picturesque medieval village of San Quirico d’Orcia. Riding across the vineyards of Brunello di Montalcino along the Via Francigena we’ll eventually reach the village of Torrenieri. From there a few kilometers on tarmac along the old via Cassia will lead us to the hilltop medieval village of San Quirico d’Orcia, where we’ll hit the unpaved road to Bagno Vignoni, a cosy medieval village built all around a thermal water pool, passing the recently restored Vignoni castle. Day 7: Bagno Vignoni to Ponte a Rigo – 40 km. (30 on unpaved roads) – total vertical: 900 m.
Ride along the Via Francigena to the imposing castle of Radicofani, the highest point of this mtn bike tour. After a steep but short climb to the medieval village of Castiglione d’Orcia, the via Francigena continues along scenic rolling hills with stunning views over the whole valley before descending to the Formone creek. After a few kilometers on single track along the creek we’ll be climbing again to the top of the Radicofani hill, where an imposing fortress was built back in the Xth century. From there an exciting 10 km. downhill will lead us to the bottom of the valley at the village Ponte a Rigo.